- Gloria J. Katch on 三月 8, 2016. What is the ABC Foundation? We’ve all heard the saying: it’s as simple as the A-B-C’s. Unfortunately, this is not the case when A-B-C is an acronym for After Breast Cancer. In fact, Alicia Vianga and other kindred survivors of breast cancer, discovered medical services for patients often dealt with prevention, treatment and care, but there was nothing to physically or emotionally support women in dealing with the aftermath of the disease that often leaves women dreadfully disfigured. That is until Vianga developed ABC, a national charity, four years ago, to help women feel beautiful, self-confident and whole again. 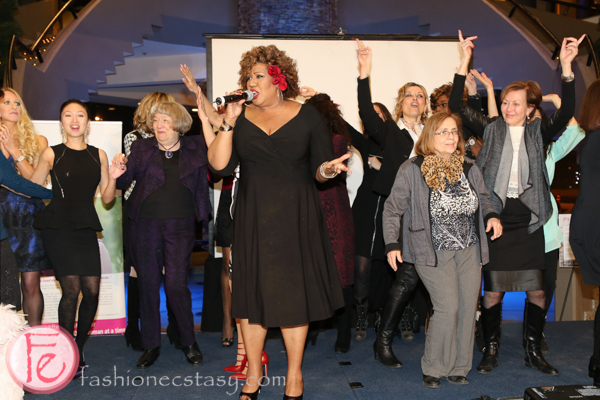 ABC’s hosted a fundraiser at the Riviera Banquet Hall and Convention Centre last week to raise awareness as well as funds for this unique cause. Juno Award winner, Denny Simone performed at this V.I.P. reception that brought together sponsors, volunteers, survivors and other people interested in the organization and how it serves the public. As a race walker and kickboxer in mint condition, McCormack said learning that she had both of these life-threatening diseases at 38 years of age was shocking and the biggest: “double whammy.” Initially, she had no symptoms, but soon after a lump developed in her breast that grew to the size of a golf ball. She had both breasts removed because she didn’t want to take the chance of this aggressive cancer returning. She underwent reconstructive surgery, but it wasn’t successful. A lot of women stuff socks and tissues into their bras, which makes it difficult to wear strapless, low-cut tops and bathing suits. She recalls diving into a pool, just to be told minutes later to retrieve one of her makeshift, styrofoam boobies floating about. “Stuffing items into your clothes is very uncomfortable, especially for athletes,” said McCormack, adding, half of her wardrobe wasn’t wearable anymore. Eventually, she had to transition to prosthetics and specially made bras to make her appear normal in her clothes. Initially, McCormack didn’t realize how expensive these items were, and unaffordable for many women. Prosthetics cost about $500 each, and only last about two years. The After Breast Cancer Foundation provides women, who don’t have insurance, up to three mastectomy bras each year and a new breast prosthesis ever two years. It also offers camisoles along with new wardrobe items for a fresh outlook on life. Women often need to focus on re-creating a healthier body image and lifestyle. Now, ABC provides these items for women, along with camaraderie and support of all those who shared in this struggle. 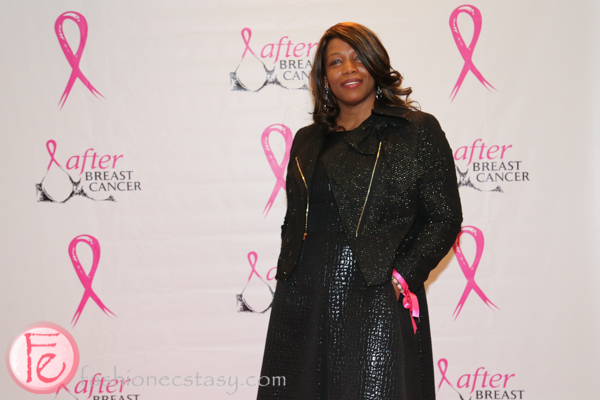 One would assume that surviving breast cancer would give the patient a new lease on life. However, statistics indicate many women experience emotional scars, including depression and high divorce rates following breast cancer. Many women feel unattractive and self-conscious about themselves, so exchanging and sharing similar stories and experiences with other survivors is inspiring. The ABC organization chose 12 women last year for its H/SHE Project, which included a complete makeover with hair and makeup done by professional stylists and a ball gown for a beautiful party. Their portraits were framed into a calendar, which is used to raise funds for the cause. “The entire evening was like a celebration of enduring the entire process, and allowing women to feel their feminity again,” notes McCormack. While most cancer and other disease sites use the word, “survivor”, McCormack believes that sounds too much like the afflicted person “clawed your way through” a trauma. Since life is a learning process, she prefers to use the word “graduated” from having cancer. The ABC organization does another fundraiser called the Pink Gala in September to kick off breast cancer month. The board members offer information “clinics” that inform people about their cause, as well as connect with people from coast to coast through hospital programs and its website. They also try to reach many underserved and rural areas. It is important to note that men contract breast cancer, although it is not common. Men wear prostheses too and they can also receive support from ABC. “Breast cancer continues to increase, and the trends indicate that it is affecting younger women each day,” pointed out McCormack. According to Statistics Canada, in 2014, 24,400 women would be diagnosed with breast cancer, and 5,000 would die from it. On a smaller scale, the Ministry of Health states one in nine women are expected to develop breast cancer in their lifetime, and one in thirty will die from it. However, the treatments are improving, as well as the ability to target certain types of breast cancer, depending on what area of the breast, cancer cells appear. It is important to be screened for breast cancer, especially if you have any of the high-risk factors, i.e. family history of breast cancer, no full-term pregnancies, high breast tissue density or previous biopsies or breast disorders showing abnormal cells. For those who are post-menopausal, obesity, smoking and physical inactivity contribute to breast cancer, as well as taking hormone replacement therapy, (estrogen plus progestin) for more than five years. Anyone interested in becoming involved in this organization, including volunteering or donating can reach out to them. In retrospect, McCormack said her biggest risk factor for obtaining cancer was stress. “I was trying to be superwoman.” In between, competing nationally, being a mom to two children and studying for her real estate license, she was taxed. “Stress is definitely a trigger,” she noted, adding that getting that message across to people is important. Besides, McCormack is not about looking back, and she has already won the fight of her life.